It's been a while since I posted on my blog. 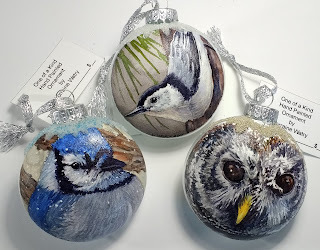 I thought my process to paint with watercolor on glass ornaments during this Christmas season would be a good post. I use Daniel Smith's watercolor grounds painted on the surface with two or three coats and then leave it to dry completely. 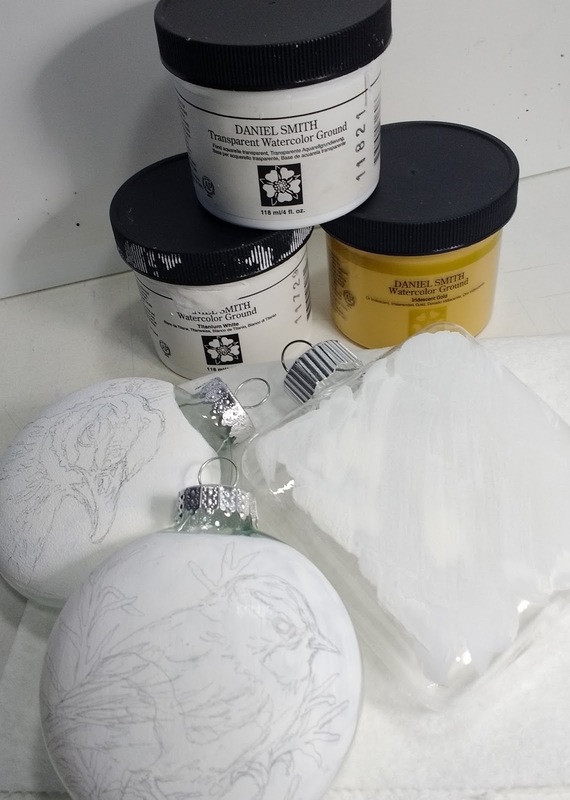 This surface then allows me to paint with watercolor rather than the acrylics that I used to use on the ornaments. 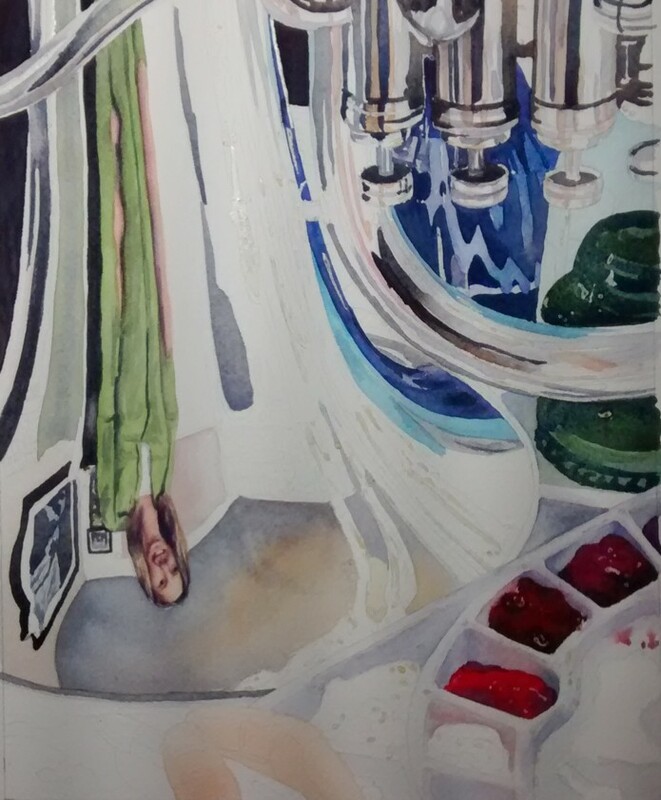 The Daniel Smith grounds perform very much like watercolor paper and allow for all the normal watercolor techniques including lifting, glazing, and wet into wet. 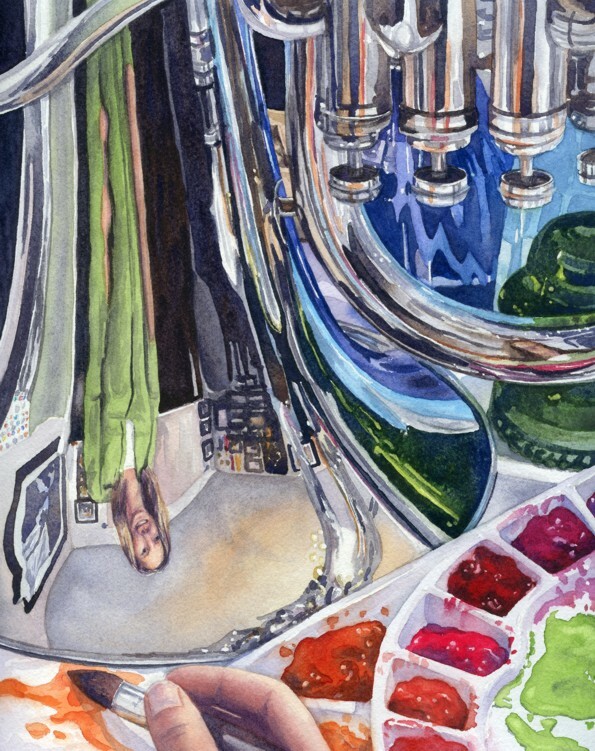 Daniel Smith has 5 watercolor grounds - Transparent, Titanium White, Opalescent, Iridescent Gold, and Black. They can be used on almost any surface. 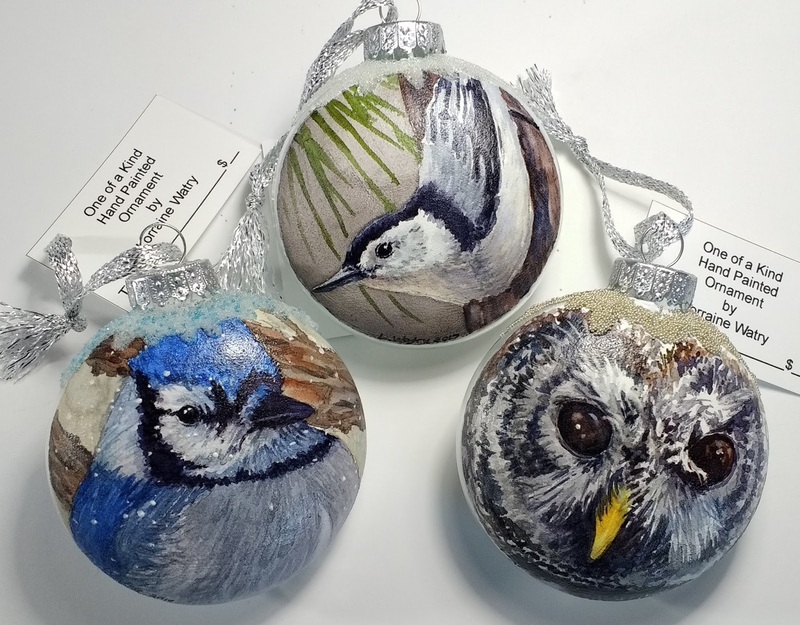 Some of my finished ornaments. I have begun to add more value on the shadows of the figure and now the arms and legs are starting to look muscled. I painted in the hair with mixes of ultramarine blue, burnt sienna, and some quinacridone magenta that creates a dark blue/brown. I painted in the shiny gold/orange sunglasses. 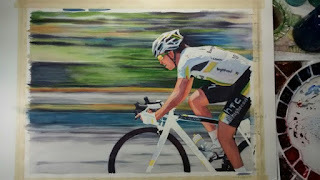 I have started adding the colorful stripes and markings on the bike with new gamboge yellow and sap green. 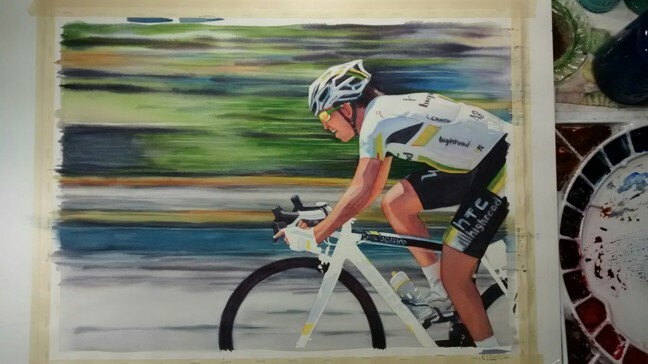 I am looking for areas that I can paint in to help describe the shapes before I paint the black on his shorts and the bike. I will continue to make adjustments to the values as I add shapes. I can already tell that I may have to darken the shadow on the side and back of his jersey. 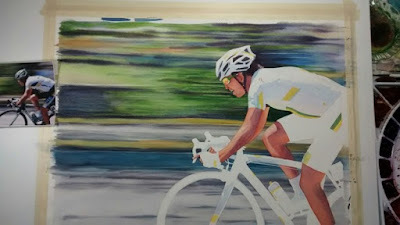 I am continuing to work on my new bicycle painting. 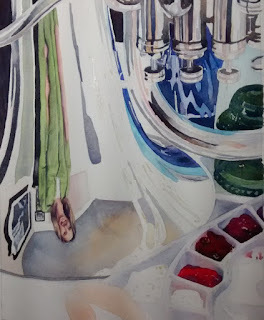 I decided to title the painting, 'Shifting Gears'. I have added more layers to the cyclist's skin to increase the value and start to introduce the lights and shadows I am using the same color mixes I talked about in the first post of this painting, but I have started to increase the amount of pigment in the mix to increase the values. When working with a figure in a painting, I usually start by painting the face. That way if the face is not looking right, I can start again if I need to without having invested a lot of time into the piece. 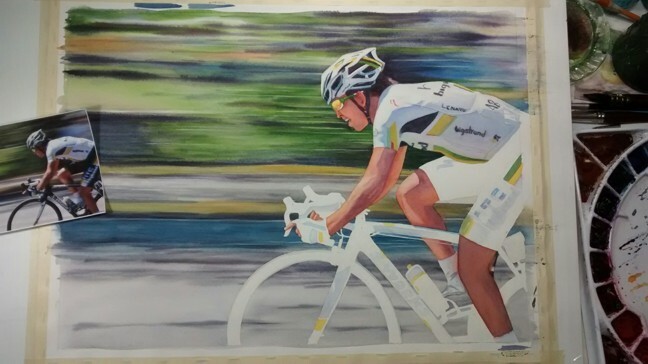 I will continue working on the figure a little longer and then start the clothes and bike. I am still thinking of adding a warmer stripe of color in the background, but will wait until I get more of the cyclist done before deciding. As far as watercolor paint, most of the paint I now use is from Daniel Smith. I would highly recommend these paints because the pigment is very saturated and they reconstitute and become juicy even after drying in the wells on my palette. 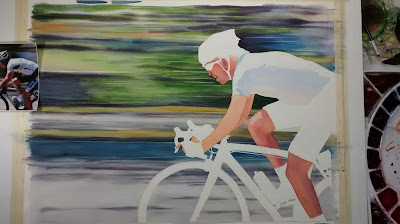 I started working on this cyclist last week. I have had this photo for several years now and every now and then I think about painting it. Then I heard of a show that will feature bicycle art and decided now would be a good time to try it. The background is blurry because when I was taking the picture I panned with the cyclist as he was going by, thus blurring the background. 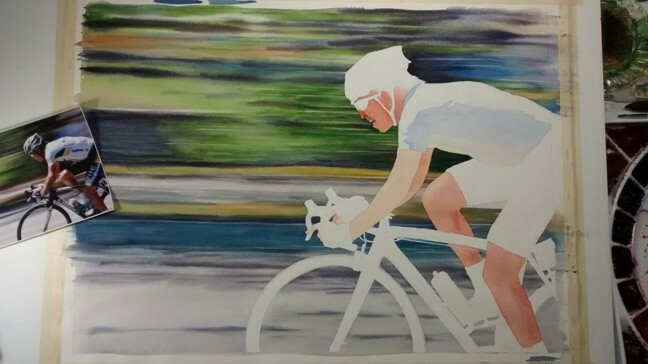 I started the painting by masking off the cyclist and bike using masking tape and liquid mask to protect them while I painted the background. Then I wet all of the background and started painting on the colors that were blurred. 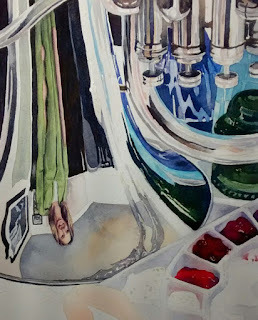 I may still go back into the background to adjust values or add some brighter color. 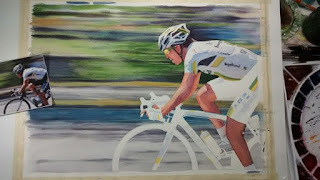 But, I will wait to make adjustments until I have more of the cyclist painted in. Today, after removing the mask from the figure, I cleaned up the edges and then started by painting a base coat on his skin using a very thin mix of cadmium red with a little aureolin yellow mixed in. After this dried I started layering thin glazes of color onto the face and limbs. I used mixes of Permanent Alizeran Crimson & burnt sienna, Perm. Alizeran & Ultramarine Blue, as well as the Cadmium red & Aureolin Yellow mix from earlier. I will continue adjusting and adding to these layers to create the shadows and highlights. His shirt was painted with a variegated wash of cobalt, manganese, quinacridone rose, and aureolin yellow. I used the yellow to make the front of the shirt glow. Normally I would paint the shadows in last, but because there are some defined graphic shapes and lettering that I don't want to possibly blur, I started with the shadow. 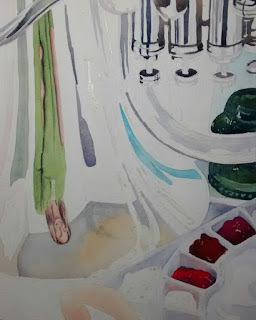 I will try to post the stages of the painting as I work on it. I am a member of a cooperative gallery in Colorado Springs. During our winter months when the gallery traffic is a little slower we don't have featured artists in the front windows, but do group shows instead. This year we decided to have some theme months from January to March. We chose to do self-portraits for January. I decided to have fun and not do a conventional self portrait. I love to paint metal and glass and I new my sons baritone would make a great way to get a reflection of myself. The horn automatically flipped my reflection upside down, adding to the fun of the image. I did not want to spend a lot of time on this painting because I had to fit it in around other paintings, classes, and the holidays. So, instead of masking a lot more of the lights in the horn, I only masked the whites and tiny highlights. You might be able to see a little masking fluid on this first image. After masking, I started on the grays of the baritone and then jumped over to work on my self portrait. I figured if I didn't get my face right, I could start over before I got to far into the painting. One of my favorite grays to make now is ultramarine blue and italian burnt sienna. I continued working around the painting. You can see some of the other reflections in the horn now. I also started the blue water bottles that were behind the baritone and reflecting in the metal. I wanted the paint on the palette in front to be warmer and provide a contrast to the blues and greens in the back. For the palette, I used pure pigment, and put it on pretty heavy, so that it would appear solid like the paint in my real palette. I started to add more darks (mixing ultramarine and italian burnt sienna as dark as it would go). As, the painting neared completion, I added some warm reflections in the horn and completed my hand in the lower left. I like to start my skin tones with a warm mix of cadmium red and aureolin yellow. Then I add layers of other mixes. The last time I did a self portrait was college. I am actually pleased with the final painting.